Hamamelis x intermedia 'Arnold Promise' has sunflower yellow flowers from January – February, providing vibrant winter interest. Forming a much denser shrub than other Hamamelis, it produces a thicket of yellow/orange flowers that release a sweet perfume into the cold winter air. After the flowers, large green leaves open that turn attractive shades of yellow and orange in the autumn. 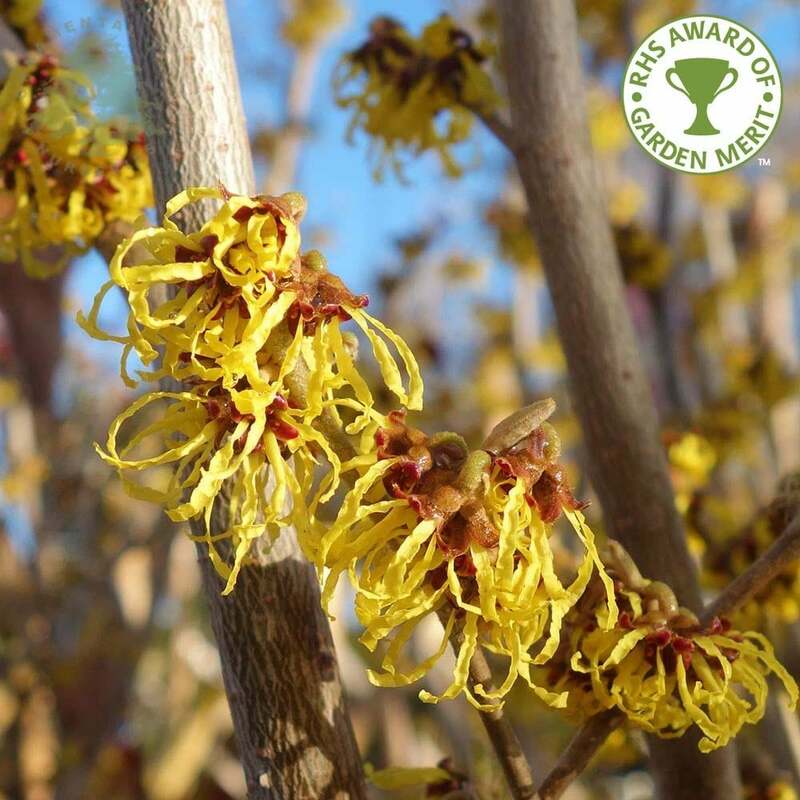 This award-winning yellow Witch Hazel shrub has a spreading, vase shaped form that provides beautiful architectural interest and will grow to 4 x 4 metres in 20 year. 'Arnold Promise' requires a well drained, acid - neutral soil in sun or partial shade and can tolerate some exposure. In addition, this winter flowering shrub provides important value to wildlife. Our pot grown Yellow Witch Hazel shrubs can be planted at any time of the year. Start by removing all weeds and grass within a metre of your intended planting hole. Dig a square hole as deep as your root mass and approximately 2x as wide. To help your shrub establish more effectively, especially if you have poor soil, we advise sprinkling root grow in the hole. If you're planting Yellow Witch Hazel in spring or summer, water well and regularly for the first few months. Increase watering if there are extended periods of hot or dry weather but if you're planting in autumn, you may only need to water a little. We stock a range of irrigation kits, suitable for a variety of planting schemes. Yellow Witch Hazel shrubs do not require regular pruning. If you wish to tidy up your witch hazel shrub, do this during the dormant season. Focus on removing any damaged, diseased or overcrowded branches.